ST Gall’s defender Sean Kelly insists the Milltown Row men have lost none of their hunger as they begin their bid to reclaim the county title with a tough opener against Portglenone this Saturday. Their quest for an unprecedented ninth successive title was ended by eventual champions Cargin at this stage of last year’s Championship. Many felt it was the end of the road for a side which dominated the Antrim Championship for the best part of a decade and claimed the 2010 All-Ireland club title along the way. However, Kelly insists people have been too quick to write off the former county kingpins. “To be fair, it is funny the statements about the team running out of legs and that,” said Kelly. “The average age of the team is probably younger now than it has ever been. A lot of people have said that about this team for the past four or five years. “Since we won our first Championship in 2001, there has been a very high turnover. “When we got beat last year, a lot of people thought it was the end of this team but the team has stuck together. “Some of the players may not play as big a role or may not be the big names in the team anymore but there are plenty of young lads ready to step in and carry on and represent the club as well as possible. “That means we can’t rest on our laurels. None of us are sitting back and thinking we have had a good run. Kelly also added that they are self-motivating and aren’t driven by seeing arch rivals Cargin succeed them as county champions. “It wouldn’t be the way we work,” said Kelly. “We never look to see what other teams are doing to drive us on. We are always motivated internally. We always look to get the best out of the players in the dressing room. St Gall’s remain the bookies favourites to regain the Padraig McNamee Cup. When they last lifted the cup in 2014, Portglenone had won the Intermediate championship. Casement’s secured a victory on their return to senior football last year by beating St Teresa’s before losing out to Lámh Dhearg in the quarter-final. When the sides met in the league, St Gall’s claimed a comprehensive 4-15 to 0-7 home win but Kelly insists Saturday’s game in Corrigan Park will be an altogether tougher assignment. “It will be a different game. When Championship season comes around, it is a one-off game,” said the St Gall’s ace. “They will be well up for it and they will see it as a scalp on Saturday. They have plenty of energy and they have a few boys on the county team. “I am sure they are looking at the match and thinking they have nothing to lose. “Sometimes that can be a good thing because there is little or no pressure on them at this stage. St Gall’s are sweating on the fitness of both Niall O’Neill and Sean Burke ahead of Saturday’s game and Kelly admits both are in a race against time to prove their fitness. “We are hoping they will be fit but it will probably be a late call with both of them,” said Kelly. “Niall has an ankle injury and he has done very little training lately. Burkey has been doing little as well. “They didn’t play for the hurlers last Saturday which isn’t a good sign. If they were close enough, they probably would have played. Portglenone are also set to be without Antrim panellist Dermot McAleese, who suffered a broken collarbone in their 1-11 to 1-9 preliminary round win over Glenavy last month. While St Gall’s have the strength-in-depth to cope without Burke and O’Neill, Casement’s can ill afford to be without their leading attacker. If St Gall’s can limit the influence of Antrim midfielder Niall McKeever, they should book their place in the last four. Meanwhile, St John’s take on Ballymena in their quarter-final on Friday night in Ahoghill. The Whiterock Road men bowed out at the first hurdle last year at the hands of Lámh Dhearg. Kevin Cunningham and Ronan McCafferty were red carded that day and will miss Friday’s game through suspension as a result. The Johnnies U21s went on the retain their county title and reached the Ulster club final before losing out to Watty Graham’s. However, manager Locky McCurdy insists there is no burden of expectation on his young charges. “U21 to Senior Championship is completely different,” said McCurdy. “It takes time. It is all about keeping them together. Obviously the guys who were involved in the U21s got good Championship experience regarding pressure and things. 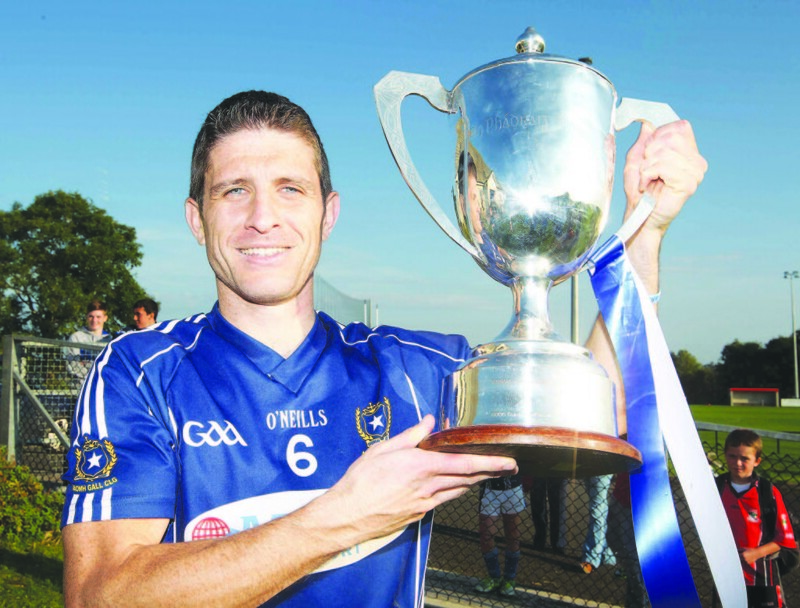 “It takes time to gain senior football Championship experience. Ballymena caused something of an upset when they defeated St Teresa’s in the last round. The All Saints are led by Antrim veteran Sean McVeigh but McCurdy is fully aware that their opponents are far from bring a one-man band. “We will certainly be going in as favourites but Championship football is Championship football,” said the Johnnies boss. “We won’t be complacent. Ballymena have nothing to lose and anything can happen on the day. St John’s will give late fitness tests to both Ryan McNulty and Simon McDonagh although the club’s dual players came through last Sunday’s SHC clash with Rossa unscathed. Ballymena’s surprise win over St Teresa’s will help guard against any complacency in the Johnnies camp and they ought to prove too strong for the All Saints.